Caitlyn Mayer (EVSS ’16) knows a thing or two about quality – most notably, water quality. 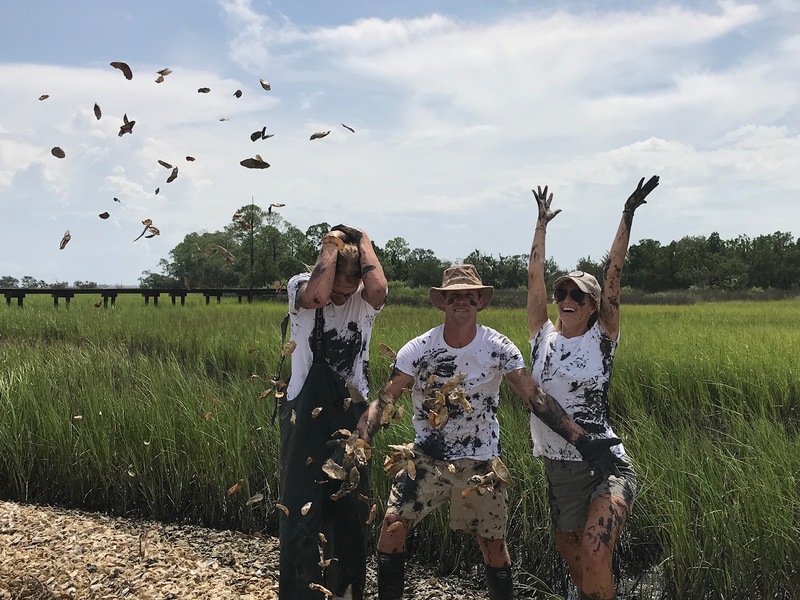 So it’s no surprise she is one of the contributing founders to one of the few local oyster farms within the Charleston peninsula, Charleston Oyster Farm. After finishing her research on enhancing water quality in the ACE Basin, SC through the M.S. Environmental Studies program, Caitlyn decided to apply those skills to break into the lucrative and renowned Charleston hospitality industry. 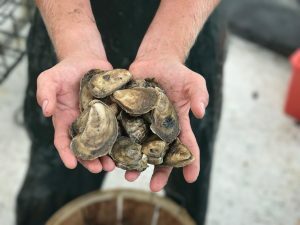 Similar to the popular “farm-to-table” concept cultivated by several local restaurants, Charleston Oyster Farm abides by the “marsh-to-table” approach, delivering fresh oysters to your dock, doorstep, or establishment. Their mission centers around promoting ecosystem awareness and decreasing harsh environmental stressors, while continuing to distribute a quality product fundamental to culture of the Lowcountry. Caitlyn and her crew use off-bottom cages, allowing oysters to brine at low tide for maximum flavor and preventing little unmentionables (i.e. barnacles or algae) from attaching to their shells – thus creating a cleaner and easier cut for oyster shuckers. These cages simultaneously provide a protective haven for small aquatic species; the plentiful ecosystem and the abundance of fare to choose from encourages larger animals to relocate to the area as a direct result. You can get your first taste of their salty Stono Selects and Mosquito Fleet Petites this Friday, November 24th, from 5-7pm at the Holy City Shuck Fest, located at Holy City Brewing. Oyster singles/select beer parings will be available as you learn about the local mariculture industry and oyster farming in the Lowcountry. Family, friends, little ones, and furry pals are welcome! Additional event information can be found through Facebook of the Charleston Oyster Farm website.